Q&A with our Varsity Predators. Hear what they have to say on what it means to play Preds! Waterloo Region Football (formerly Twin Cities Football) is a non-profit organization affiliated with the cities of Kitchener and Waterloo. Our players come from all over Waterloo Region, including St. Jacobs, Elmira, Wellesley, Baden, Breslau, Palmerston, New Hamburg, Breslau, St. Clements, Drayton and Maryhill. Our objectives are to demonstrate and inspire integrity, character, fair play and sportsmanship among our young players. WRMFA works hard to provide athletes, ages 19 and under in our region the opportunity to play football where they can develop their skills and fitness. Our emphasis is on teaching football fundamentals and understanding fair play while competing at the highest levels. 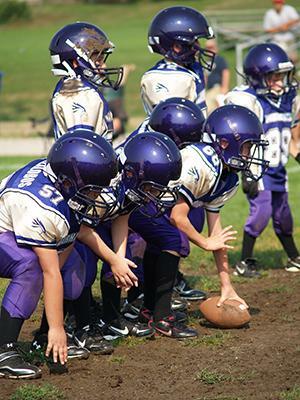 The Waterloo Region Minor Football Association aspires to provide all youth with a quality, positive team experience that fosters a love for the game of football while allowing individuals to grow both as athletes and members of a community. Our programs focus on player development and safe football fundamentals while promoting good sportsmanship, self-confidence, discipline, competitiveness and team work. 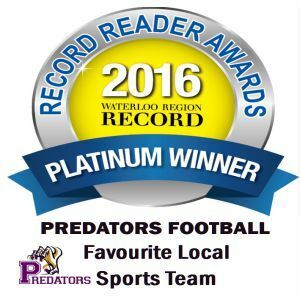 Waterloo Region Football is one of the only youth football organizations in Canada that provides the opportunity to play from the age of 5 to 19. We are run 100% by committed volunteers promoting football in our region. Want to help? Have a question? Check out our Board Member Directory and get connected! Equipment Fitting Dates have been booked. Please check out the schedule for your team. Register for 2019 Spring Preds by Feb 9 and save $50 with Early Bird Discount.